I visited Naples some donkey years back. The Italian government decorated the streets with ornaments that flashed green and red. At first we thought that they were traffic lights! After observing the locals and the drivers (the traffic continued unaffected whether the lights flashed red or green), we realised that they were just decorative street lamps! Trust me, crossing the streets in Naples had never been more exciting. 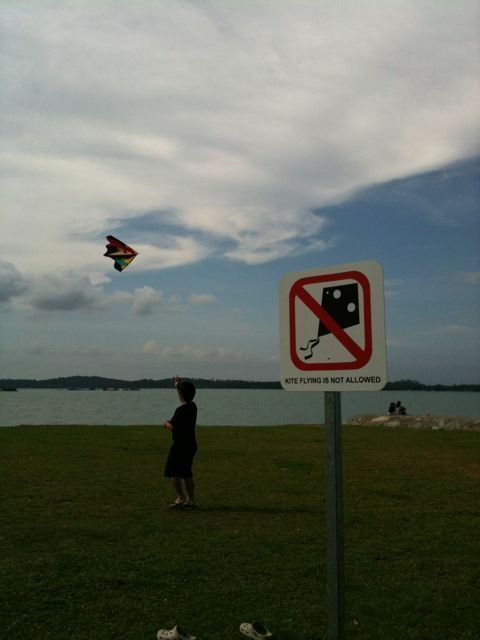 At Pasir Ris park, the National Parks have erected “No Kiteflying Allowed” signs in the park. Nice ornaments. Come to think of it, maybe people mistook the sign for “No Stingray Fishing Allowed”. It does look like a stingray right??? Share this : Click on More for Social Media preferences. Zhiwei on How do you Spell Stoopid? Anon Ny Mous on How do you Spell Stoopid? Zhiwei on The Day My Kefir Grains Died….